In 1959, Dean Lemon was looking for a Christmas tree with a friend and he noticed that the stand Harry Forrey ran on Lititz Pike was hopping. Fifty years later, Lemon is still selling trees. 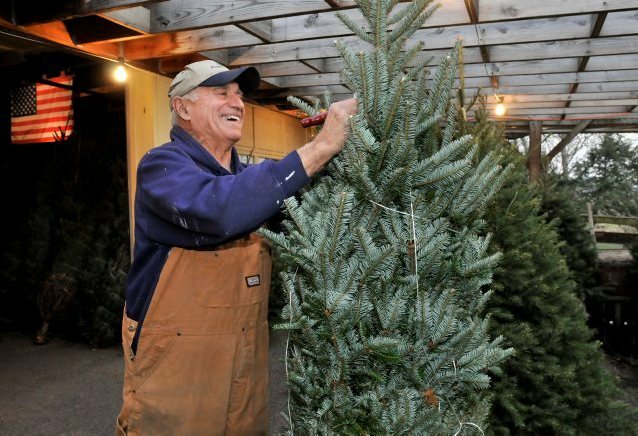 Dean’s Trees, located at the corner of Lititz Pike and Kreider Avenue, is always hopping during the holiday season. “Some weekends, you need a traffic cop around here,” Lemon said with a laugh. What began as a whim has turned into a robust business and very busy holiday seasons for Lemon – and a Christmas tradition for hundreds of families in Lancaster County and beyond. Every year, customers come from as far away as Delaware, New York and Maryland to buy Lemon’s trees. “We think they’re beautiful trees,” said Judy Kudrick, of East Hempfield, who, along with her husband, Bill, has been getting their Christmas trees at Dean’s Trees for at least 10 years. That’s because Lemon grows the trees himself. He’s got several different spots in Lancaster County where he grows trees, including a grove behind the stand, one near Landis Woods, filled with about 5,000 Douglas and Fraser firs, and one in Neffsville that holds about 1,500 trees. And in 1964, he bought a 40-acre farm in his hometown of Herndon, in Northumberland County. Today, about 30,000 trees grow there. Each season, he sells about 1,500 trees. That first Christmas, in 1959, Lemon, then 23, and Frantz bought 100 trees – all Scotch Pines – for $1.50 each and sold them for about $6. They sold out quickly and had to buy more. Lemon figured it would be an easy little sideline business to make some extra money for the holidays. Both men were teachers in Manheim Township School District (Lemon taught industrial arts) and the pay was low. Frantz left the area, but Lemon carried on the following year, hiring fellow teachers and students to help him with sales. For a long time, sales doubled every year. Lemon was on to something. Weekends were busy and exhausting. Lemon’s wife of 54 years, Shirley, a teacher herself, helped out with the cash box and, later, the cash register they brought in as the business grew. Their three kids, Dean, James and Kim (yes, the same Kim Lemon who anchors the news at WGAL) helped on weekends. These days, on the busiest weekends, up to 20 people can be helping Lemon out. They continue to be teachers – many, like Lemon, now retired – and former students. Sometimes, a friend will call and tell him about someone who’s lost a job or needs some extra money. Lemon’s happy to be able to help them out. He helps out his customers, too. “People come in who don’t have a lot of money and I’ll help get them a tree. And I do that with churches, too. Give them lots of greens,” he said. Many of his customers are the children and grandchildren of earlier customers. Lemon and his crew seem to know and recognize them all. “When you’re a teacher, you get to know everybody,” Lemon said. One customer, who asked that her name not be used, noted that last year, they got their tree late. The stand, which is Brook Lawn Farm Market in the spring and summer, has expanded through the years and now includes a walk-in cooler, where Lemon keeps the greens, roping, holly, wreaths and mistletoe he also sells. Some days, the cooler, which stays at a constant 40 degrees, is the warmest place around, according to Ken Leister, who has worked at Dean’s Trees since the beginning. A typical day at Dean’s Trees can last 12 to 14 hours. Weekends can be insane. There’s a lot more to it than just ringing up a sale. “I don’t think people realize everything that goes into it,” Leister said, noting that new trees have to be planted, nurtured and shaped. Decisions have to be made about when to cut them, and then they have to be netted and transported to Lancaster. When you’re talking about thousands of trees, that’s a lot of hauling. The average tree weighs about 60 to 75 pounds. Lemon jokes that he’s getting too old to keep the business going. The hale and hearty Lemon, who retired from teaching in 1985, isn’t slowing down, though. In addition to his tree business, Lemon had his own construction company and has built houses in Wetherburn, among other places. But he is in trouble.